Today we will learn 「敬語」( = keigo). Uh-oh….tough one! Yep! It is difficult and many Japanese people get confused as well. 敬語 ( = keigo) or 尊敬語 ( = sonkeigo) is “honorific expression/language“. In order to speak Japanese properly, we have to learn this 「敬語」（ = keigo) and 「 謙譲語 」( = kenjyougo) , humble or modest version of Japanese. 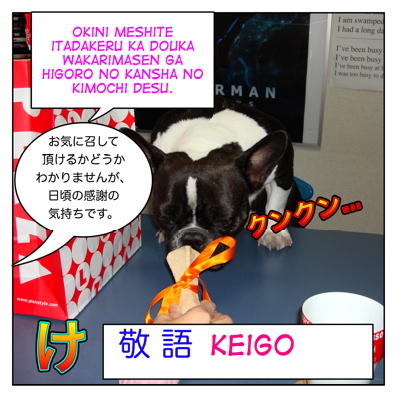 You use 敬語 ( = keigo) towards people who are socially higher, customers, or people you are not familiar with. You, students have to use 敬語 ( = keigo) towards 先生 ( = sensei), teachers as myself! You hear 敬語 ( = keigo) in daily conversation all the time in the stores, the restaurants, on the street, on the phone, etc. Let’s take a look at the phrase in the picture first. oki ni mesuka douka wakariamsen ga.. This is a token of my (continuous) appreciation. Now, before going to 敬語 ( = keigo)、let’s see the patterns of making 丁寧語 ( = teineigo) polite form. The simplest way to make some Japanese words more polite is to add 御 ( お ( =　o) or “ ご( = go) ) to the beginning of a word. = Okuchi ni au ka douka..
*お元気ですか？ ( = ogenki desuka) ? → (o+genki desuka?) How are you? The Kanji for “o ” is 御 and its’ other way of reading is “ご ( = go ) “. So some words take “o “ and some take “ go “. (And some can’t take either one.) It depends on the word. * 御名前 is read “おなまえ ( = onamae) not “ごなまえ ( = gonamae)”. But don’t overuse this. It would sound funny if you use it too much and sometimes it sounds strange if men use it. * お野菜 ( = oyasai) vegetable :Fine and acceptable! * おジュース ( = ojyuusu) : juice This is possible but sounds a bit overdone. When you refer to someone’s family, you have to keep it in mind to use the polite form. For example, 母 ( = haha) usually refers to your own mother. お母さん ( = okaasan) could be your mother or another person’s mother. お母様 ( = okaasama) or お母様方 ( = okaasama gata) ( plural mothers) are very polite form to address other people’s mothers. = Watashi no haha wa 60 sai desu. = My mom is 60 years old. = okaasama wa ogenki de irasshaimasuka? (Ex. 〜になる ( = ni naru)、〜になられる ( = ninarareru) and etc. Note : The first three verbs are ( ~になる =~(ni)naru ) form. The next three verbs are 〜られる　( = ~(ra) reru) form. The last three verbs are the one which take special forms. Now your turn! Read the following casual sentences and make them in 丁寧 ( = teinei) ,polite form, and then try to make them inake them iform! Good luck! = Ashita kaisha ni kuru? = Are you coming to the office tomorrow? = Konshuu no kaigi wa dousuru? = What are you going to do about the meeting this week? = Kono eiga mita koto aru? = Have you seen this movie? = Ima, Suzuki san wa dekakete iru no? = Is Suzuki-san out now? = Ryouri, sameru kara hayaku tabetara? = Help yourself before the food gets colder. = Kore dare ga kaita e? = Who drew this picture? = Do you know Mr.Tanaka? = Ashita kaisha ni kimasuka? = Ashita wa kaisha ni irasshaimasu ka? = Konshuu no kaigi wa doushimasu ka? = Konshuu no kaigi wa dou saremasu ka? = Kono eiga wo mita koto wa arimasu ka? = Kono eiga wo goran ni natta koto wa airmasu ka? = Ima, suzuki san wa dekakete imasu ka? Tadaima, Suzuki-sama wa odekakete de shouka? = Ryouri ga samete shimau node hayaku tabetara ikaga desuka? = Douzo, oryouri ga samete shimaimasu node ohayaku omesiagari kudasai . = Kore wa dare ga kaita e desu ka? = Kochirano e wa donata ga okaki ni natta node shouka? = Tanaka san wo shitte imasu ka? Tanaka-san wo gozonji desu ka? コンビニ敬語 ( = conbini keigo) 、ファミレス敬語 ( = famiresu keigo) or バイト敬語 ( = baito keigo) part-time. Recently the peculiar form of 敬語 ( = keigo) among young people who work for the family restaurants or convenience stores is getting controversial. = Kochira menyuu ni narimasu. → Kochira ga menyuu nde gozaimasu. = Okaikei, nisen en ni narimasu. = Okaikei wa, nisen en de gozaimasu. = Kochira, A ranchi no hou ni narimasu. = Kochiraga A ranchi de gozaimasu. = Ichiman en kara oazukari shimasu. = Ichiman en oazukari shimasu. So like all anguages, the Japanese language has been changing,too. = Honjitu gotabouchuu kochirano burogu ni irasshatte kudasatta minasama , makoto ni arigatou gozaimashita. mata no okoshi wo kokoro kara omaci moushiagete orimasu. = Thank you for taking time out of your busy schedule to visit this blog. I really hope you come visit us again. Check my other 敬語 form lesson. Can you please tell me if the Te kudasai form of “goran ni narimasu” is “goran ni natte kudasai? If it’s correct, why do I also hear people use goran kudasai? ご覧になってください。= Goran ni natte kudasai. But the shorten version ご覧ください ( = goran kudasai) is more common because it sounds “simpler”. You may also want to check my Honorific Form lesson. Click here. They both describe the state of doing something. So they are all correct. As for the “benefit”, ~なってください／ください is used when the speaker asks the listener to do something in a polite way. For example if you say, ご覧いただけます/お待ちいただけます then　the action will benefit the person doing it. I’ve been looking for jobs located in Japan online and the requirement is knowing how to speak business Japanese. I’m wondering if 丁寧語 is sufficient as many young Japanese people don’t know how to speak 尊敬語 or 謙譲語 as well. Is business Japanese really required? Do young Japanese people use 敬語 during working hours? I really want to work for a Japanese company someday. Hope you can answer my question. It depends on what kind of workplace you apply for. I’d say, if you speak 丁寧語, you would be fine in a general work place. Using the right 敬語 is difficult for even native speakers. So as I mentioned in my shopping lesson, young people tend to use the wrong keigo. However, f your job requires talking to or dealing with the customers/clients/other company, some basic 尊敬語・謙譲語 will be necessary. If you have to write emails/letters, you will need another level of 敬語 and formal business terms. Could you help me with my question, please? I was wondering if Japanese children use “teneigo” when they address their parents? I’ll be thankful if you find time to answer it. Generally speaking, they use “casual” speech when they talk to their parents. i have a question regarding business keigo. may i seek the answer from you? Thank you in advance. When you eat something/when you receive something from someone. = Could I have a phone call from you? = I will give you a call tomorrow. You often see it in formal letter. 心よりお喜び申し上げます。= Kokoro yoro oyorokobi moushiagemasu. = I am very delighted to hear the news. 御礼申し上げます。= Orei moushiagemasu = I’d love to express my gratitude. when you have several verbs in a sentence, do I conjugate all of them to the honorific expression? You can focus on the last verb. When do I use お〜になる and when do I use ukemi(受身) as keigo? Also, does it not confuse the listener since passive form is also keigo? And you don’t get keigo reru-rareru and passive reru-rareru if you pay attention to the context and particles. = Kono hon wa A ni yotte kakareta. = This book was written by A. = A san ga kono hon wo kakareta. = A -san wrote this book. Sensei, I came across the suffix naku from the work wasurenaku and goshinpainaku. Is it a honorific form? I read that wasurenaku is a negative form of the honorific 忘れる but I cant seem to find any sites that support this. Please help. ~なく form is a shorter way to say ならないように so it is not a honorific form but just a polite way to say not to forget something. We pronounce 召す “mesu” (not me-su) as you said like “desu”. Hi, Maggie! Congrats on your awesome blog. I was reading this entry and I wanted to ask if there is a reason why in Japanese certain words, like certain foods take the prefix o- in polite speech. You mention お野菜 and I’ve also heard お魚　and お肉. But as you say it’s not extensive to other food words, like “banana”, etc. So why do you need the o- prefix for meat, fish, vegetables and some other foods? I read in a grammar book that the o- prefix is used for taboo words with dirty/unhealthy connotations, like お手洗い, which I can understand. Also, to some extent, with food , it could be for aesthetic reasons (i.e. to show refinement), like in English you say “pork stew” (pork being a word of French origin) and not “pig stew” but I’ve also heard お花, as in お花綺麗～！, which I don’t understand, because flowers are something beautiful and have a lovely smell. We don’t put お by its value or aesthetic reasons. It is a technique to make you sound polite when you talk to others. Women tend to use お more than men. A lot of women say お花 but if a man says “お花がきれい” it sounds a big feminine. There are no specific rules which word takes お. But usually we don’t put お in front of katakana words. You can! I know it seems to be tough but learn sukoshi zutsu! Is there a honorific expression for 興味　が　ある　? both are right ,but it dosen’t imply any meaning of 依頼. so i don’t know when we use られる and お～に　なる. one more 課長はもう帰られましたか。　いいえ、まだお帰りになりません。　can we write　いいえ、まだ帰られましせん。or not ? hope sensei can help me, thanks you. sorry for post alot ,because i see some words i write wrong so i post again. Hi tyty! You are always welcome to leave a comment or question in my old lessons. (お）〜下さい。is used for asking for a favor. Ex. おかけ下さい。= Please sit down. No. It is not correct. You don’t need “し”. Or is it typo and you wanted to say 帰られません? Then, it is correct. Oh you are the one!! Thank you sooooo much again for your contribution! We really appreciate it!!! As for the reading of 御, I also explained in my 御の字 mini lesson! I will visit your blog,too!! Oh, sorry. I was so surprised to receive such a cute postcard and, to top it all, with perfect Spanish :-). Jaja! Bueno, a veces hablaremos en español!